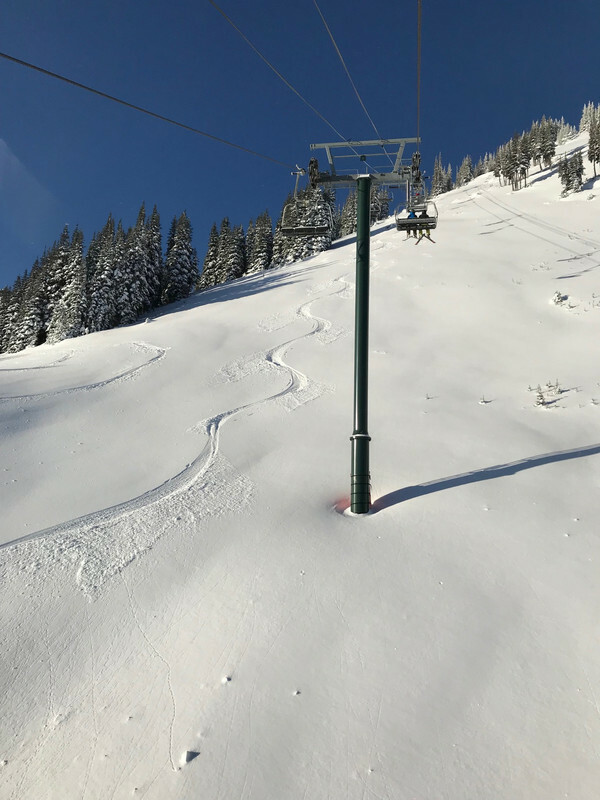 PNW ski areas are starting to spin the lifts on a limited bases. Still need more snow to get things off to a proper start. Mt. Bachelor with about 30cm of fresh. 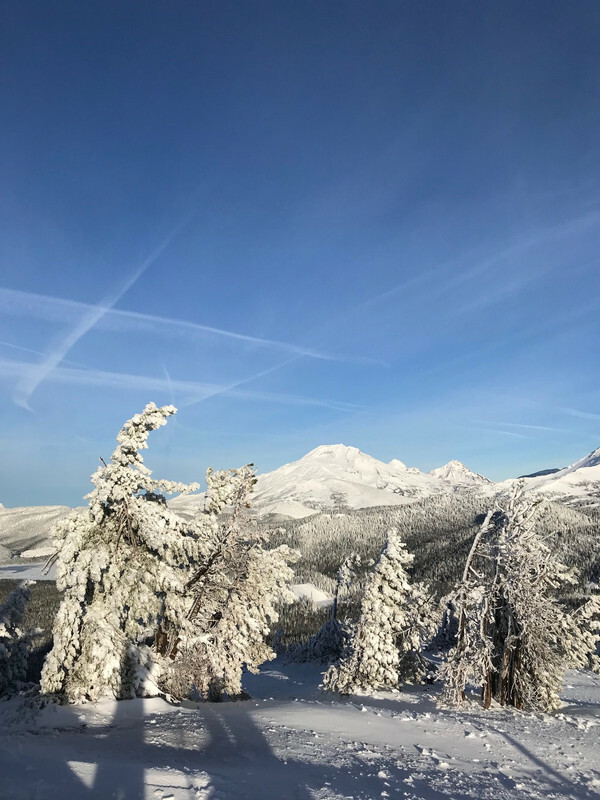 nice pics to start of the pnw stoke looks like winter is finally on its way with some storm cycles on there way this coming week , fingers crossed for low temps to match the precipitation !! Looks nice, how was last year's season with the La Nina? Last season was medicore. Started out fairly nice with some early season snow. Then it kind of went dry for a few months. Before starting up again in March. Hoping that a mild El Nino doesn't cause any issues. We shall soon find out. More weather on the way. A bit of a warm up and then cooling down. Right now Montana and Colorado seem to be fairing quite well with the storms. It's been snowing in Central Oregon since about noon. Started to snow down in town, elevation ~ 1,000 meters as I left work. Bachelor announced they are opening lower part of mtn. and possibly Pine Marten chair on the weekend. Will remain cold and on/off snow showers on Friday into Saturday. Will clear up but remain cold on Sunday, and then go back to snow showers middle of next week. Still need more snow to really open more lifts. Probably another 60cm-70cm. Mt Hood, Meadows and Timberline will be spinning lifts on Friday as well. Time to get this party started. 20 cm of fresh to start the day at Bachelor. Managed to get on 3rd chair when they loaded up Pine Marten. 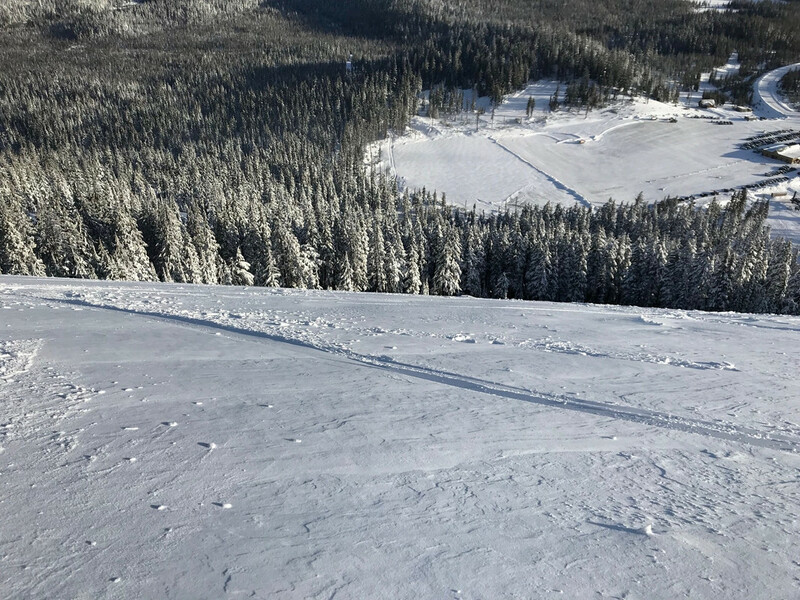 Bonus for me was that the first two chairs were snowboarders, so while the boarders got set up in their bindings, I merrily shredded the shin deep pow all to myself! Was nice medium density pow, and not too crowded for just having the lower mtn open. Low light and clouds meant the viz was just so-so. All in all a great first day of lift served PNW powder. staying in mount Shasta bend and at timberline on way up . Seems like the Sierra's is the place to be early season. Mammoth seems to be winning the snow total award so far this season. A blocking high pressure has developed out over the Pacific Coast. It has settled itself in up off the Washington/Oregon area, which should allow for some weaker lows to split and head over British Columbia and down South over California. Will be weak and fragmented and doesn't appear that much will make it as snow. Some flurries and light accumulation. GFS is hinting at some bigger storminess around the 12th to start pushing in and breaking down the high pressure blocking pattern. Too soon to have any idea how that will play out. Right now it does appear that Utah and Colorado have been the big winners over Washington and Oregon. Good news is that the high pressure is bringing cold temps, that will be favorable for snow making and preserving the current meager base that's in place. Forecast for this up coming weekend is shaping up and taking form. Currently in the Cascades it's very cold -7C to -10C at base elevation. Good for making snow, but not good for mother nature just yet. GFS is showing a front coming in around Sunday that will start the snow machine up. Currently too far out to predict accumulation, but on the low end could be just 30cm, and on the high end could end up being a meter from Sunday-Tuesday of next week. The GFS ensembles have been consistent the past few days, and showing several weak storms coming in from Saturday, and progressively building strength all the way out until next Thursday. Again, a bit too for out to be sure. But it's looking promising for British Columbia, Washington, Oregon and Idaho to get a decent amount of snow from these storms. Current track is for Washington to be in the bulls-eye but that can shift over the next few days. Colorado and in particular SW Colorado are getting snow. 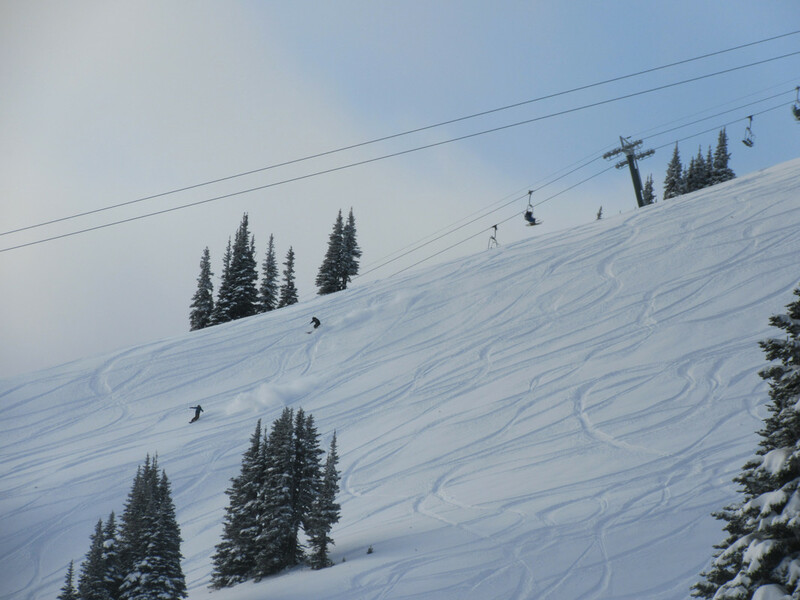 Steamboat eeked out about 24CM yesterday that snuck up on everyone. Most of Colorado with the exception of SW Colorado are about 15%-20% above snow pack totals. And they will continue to see some light snow later this week to refresh the slopes. Forecast for this up coming weekend is shaping up and taking form. The GFS ensembles have been consistent the past few days, and showing several weak storms coming in from Saturday, and progressively building strength all the way out until next Thursday. Again, a bit too for out to be sure. But it's looking promising for British Columbia, Washington, Oregon and Idaho to get a decent amount of snow from these storms. It's starting to look that way. Still plenty of December left to get the big mo a moving! Went for a hike with my brother. Only about 4cm-5cm of new on top of a soft base. The real show gets started on Sunday and continues until at least Wednesday. First storm in a series of storms is arriving on Sunday. This will be followed by another storm with lowering freezing levels, and on the tail end of this storm will be a larger, colder storm packing a decent amount of energy that should drop about 30cm+ at higher elevations above 1,500 meters. That storm which will clear out on Wednesday will be followed by another smaller storm coming in on Thursday late into Friday morning. Then after a brief clearing on Saturday a fourth storm will is looking to come in on Sunday, but too soon to tell where and how much moisture this one will pack. It's badly needed for the PNW, which is behind in avg. snow pack at this time of the year. Sunday's storm brought about 25cm at Mt. Baker and just 10cm down at Mt Bachelor. 2nd storm is set to come in on Tuesday late afternoon/early evening. It will pack a bit more punch to it. Should see double to triple the amount of accumulation from the Sunday storm. Whistler eeked out about 25cm the past 24 hrs. They should see another 10cm-15cm today as well. That does look real nice. Stormy weather right now in the Cascades. Upper lifts closed at most areas do to high winds. Gusts up to 100 km/h. But snowing. Supposed to keep on snowing into Wednesday. So Wednesday should be really good. Another storm will follow after a brief lull. Might be a bit of warm up between systems. Shouldn't affect the slopes though. Stevens and Mt. Baker might get a convergence zone and see roughly 70 cm of snow by Thursday morning. Sounds like Whistler will also do well. Might be a bit of rain at the base for a brief period as the storms roll in and then cool off as they pass. Still will be a much needed dump to open up more terrain. Looks like another storm will come in on Sunday as well. Yep, its on. We want a nice wet dump to stick and fill in. Per NWAC telemetry (wish all places had this) Crystal's rain at the base turned to snow at 6pm. Green Valley open but not Rex, so a bit of a hike back to the gondola which hopefully will be over with after this storm cycle. Just looked at Mt B site and they are at least talking about Outback, which is encouraging. Its my last year of being beholden to the school vacation schedule, and Mt B can be carnage Xmas week if its just the front side. Bachelor received 25cm overnight. Washington Cascades about 30cm and Whistler with 36cm the past 24 hours. Next system is coming in later Wednesday evening into Thursday morning. Should see similar accumulation as the last storm. As this storm passes it will bring warming and rising temps. This storm is going to stay North of Oregon. The winds will be very strong with this bad boy. Just editing to add that the forecast is showing another storm coming in Sunday evening into Monday for the North Cascades and BC Coast Range. So, more snow on tap into next week before it looks to calm down after Tuesday, Dec. 18th. Looks like Whistler and Mt. Baker are doing well with the last few storms, with more on the way. 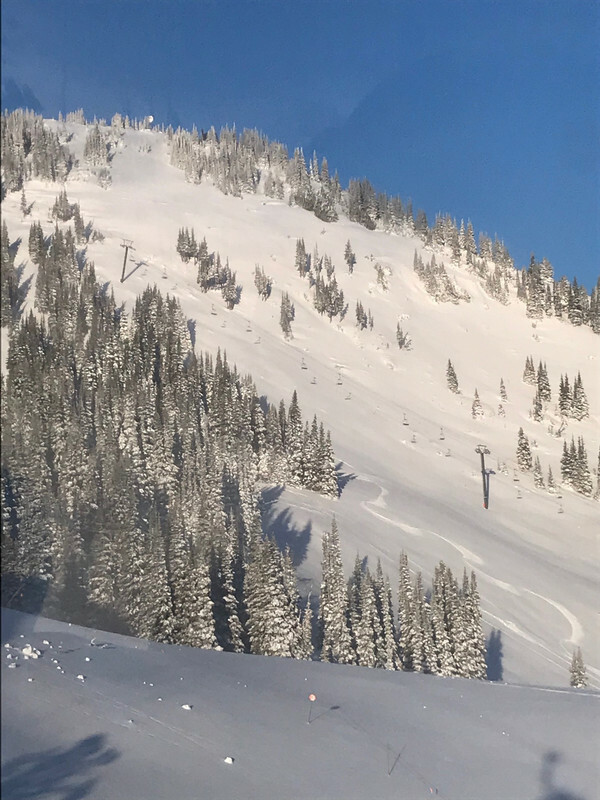 Each ski area has received close to a meter of new in the past 48 hours. 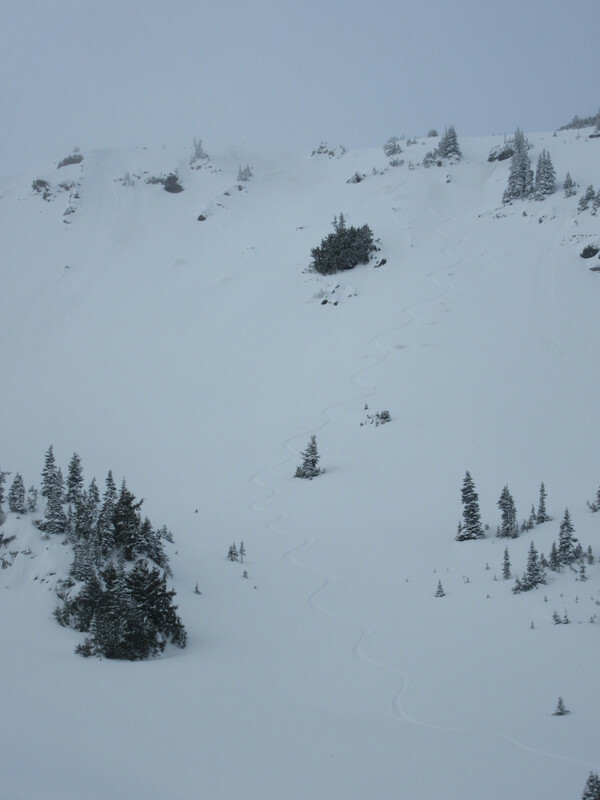 Winds were relatively strong that kept upper slopes closed at Whistler yesterday. Same goes for Crystal Mtn. Tricky part for the next wave of storms will be the snow line. Which will fluctuate from base level to mid mtn in some cases. But still looking at possibly another 50cm-100cm over the next 4 days. Won't be light powder but the famous Cascade concrete in some cases, or possible some Cascade Cream Cheese! It will be a bit tricky with wind and snow levels, but the upper mtns should avoid any rain. (Fingers crossed) Whistler might fair better being farther North. Interior BC should do okay, and have slightly cooler temps, but will still be impacted by warmer air along with each storm coming through. Saturday will be some clearing and temps will remain moderate with freeze line around 1200 meters or so going into Sunday morning with more moisture for about 10cm-20cm depending on possible convergence zones in the Central Cascades with cooler temps coming through the East passes. In any event, I plan to go investigate Crystal Mtn over the weekend into early next week and get my legs ready for the winter season! Avy risk will be high, and ski patrol will earn their keep with these storms and difficult conditions. Don't forget to say, "Thank you" when you come across their path! Edit to add - Avy danger is extremely high right now. Even in bounds slides are being reported. 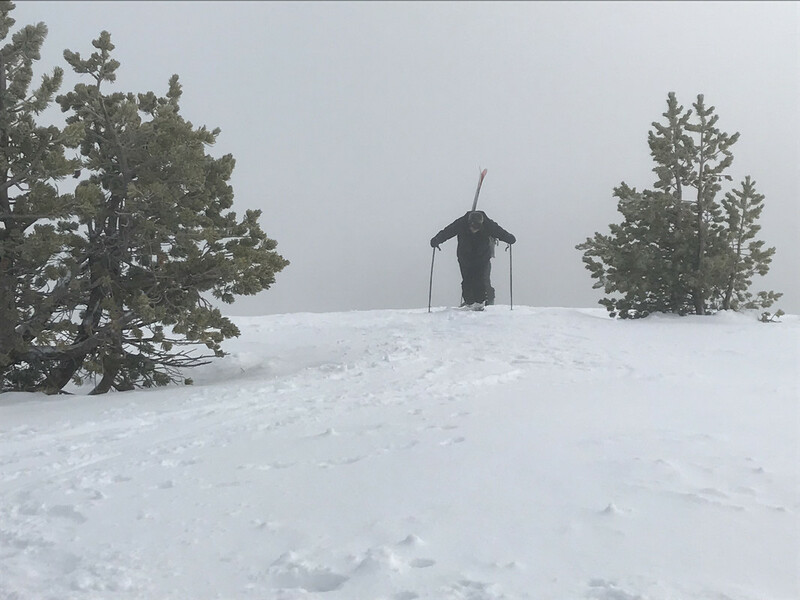 Please be careful, ski with a partner, and if you don't know, don't go! Just arrived tonight at Crystal. Snowing big heavy wet flakes ATM. They are forecasting just a few centimeters with this passing front, and then clearing Saturday morning. Hopefully it stays cool overnight into tomorrow morning, so I can get some fresh, soft turns! Then Sunday comes another front, followed by yet another storm on Monday afternoon, with heavier precipitation going into Tuesday. Crystal received about 18cm of fresh overnight. Was a good day to be out and about. Ran into Daron Rahlves in the lift line waiting for Chair 6 to spin. He was there with the Atomic folks. He was sporting a pair of Vantage 107 Ti's in a 189cm size. He's not a very big guy. Amazing what he did on skis with the big boys of the World Cup. But it was nice and light. And got first tracks, and that made my day! 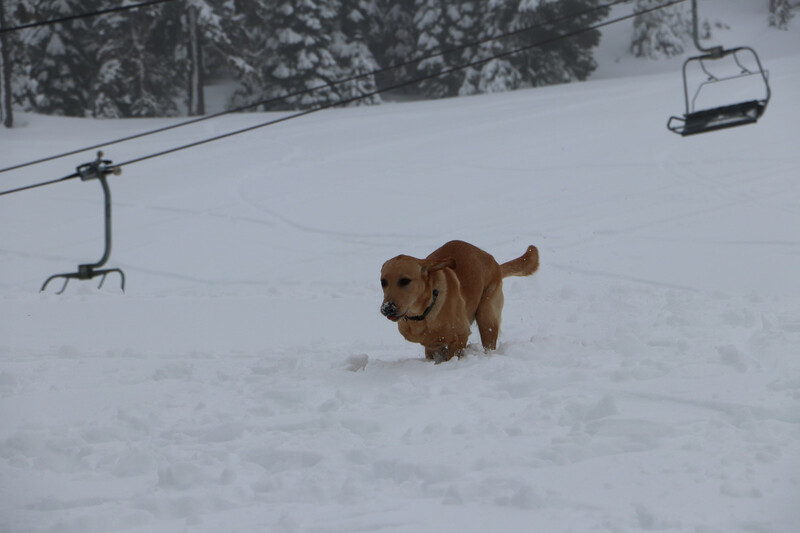 From Whistler down to Crystal in the Central Cascades they reported 20cm to 30cm at the higher elevations. Forecast calling for about 15cm-20cm overnight. (Sunday into Monday morning) However, it will be around 0C at 1,300 meters and forecast calls for a bit of a warm up into Monday afternoon. Today was 80 kmh winds with gusts over 100kmh and that kept the upper mtn closed. Wet and sticky lower down. Will be interesting to see what Mother Nature brings us on Monday morning. Would at least like to get a couple hours of skiing in before it gets too manky. Monday night another storm with warmish out of the SW winds and higher than normal snow levels. This one should drop another 20cm-30cm for Tuesday above 1,800 meters. Later next week should start to get some cooler temps. Friday might be promising. sunday was my last day in whistler and woke up to a nice surprise , freezing levels stayed low and there was 20 com fresh cold new snow down to village , due to persistent high winds things were slow to open so managed to grab some very nice turn around the upper tree line , freezing levels then quickly rose up the hill and the snow turned heavier , so packed up and started the trip home . Crystal was superb today! Great conditions with the upper mtn. closed on Sunday, Monday delivered with just under 30cm total the past 48 hrs. Really nice and light on top of the windbuff. Started to snow just after 1:30pm. Legs got a good workout, with no lift lines. Looks decent for early season. Woke up to 30cm reported at 5am on the snow stake. Was snowing an easy 2cm on hour. Just the right consistency of pow. Not too heavy and made for great conditions to just hammer it and get face shots all morning long. Lots of hootin' and hollerin' going on. Just a great day on the slopes. No pics. Was storm skiing, and not interested in stopping for photos. More snow on the way, and colder temps in the forecast. I'm already dreaming of getting back there before the end of the year! For those folks in the PNW, the powder train continues!. Whistler has been getting hit daily and nightly! Same can be said for Mt. Baker, Stevens Pass, and Crystal. Mt Bachelor also got in on the party yesterday as well. Overnight saw another 20cm plus for most mtns. Thank Ski Patrol when you see them! They have been working extra hard. 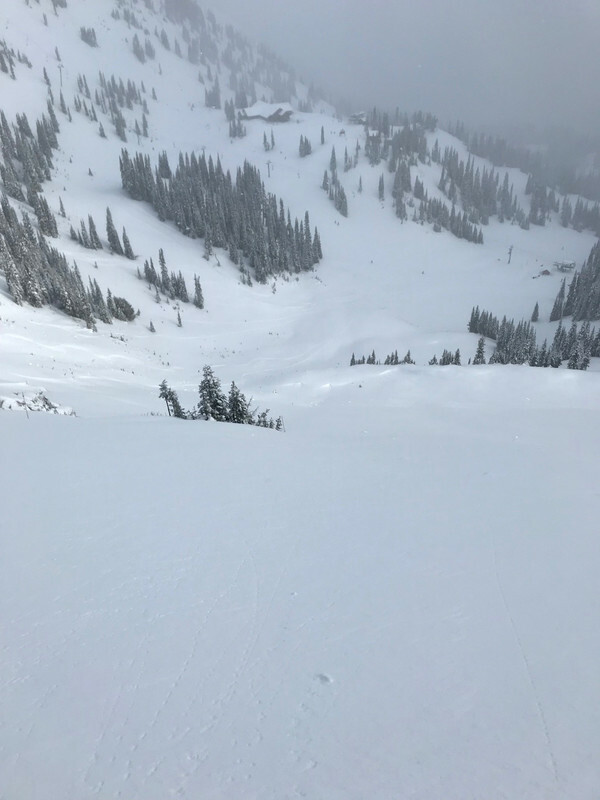 There were many an avy bomb going off yesterday at Xtal, and that will be the same for all PNW ski areas. Whistler has had some very reactive snow conditions, with an unfortunate basal facet layer buried near ground level. This is also impacting Mt. Baker as well. There's a brief respite from the action today, and then another storm with rising snow levels will impact the PNW from Whistler down into the Sierras. Then as the storm passes colder temps will come with with less precip. At least the snow will be right side up with the heavier, wet snow below, a lighter layer on top. Then it looks like another storm is incoming for later Saturday into Sunday with potential for up to 30cm of colder snow down to about 1,000 meters or even in the valleys and passes to 500 meters. Should provide for some ideal conditions and great coverage. Get after it while you can! I'm in Vancouver today, but recent storms have built up the base to the extent that Whistler's https://powdermountaincatskiing.com/ is up and running for the season as of this morning. Reports are of: "stupid deep awesomeness". And they had a free seat for me, but I have other fish to fry today... including fixing a minor defect in their booking system wot I wrote. Whistler has reported 11 straight days of precip, aka SNOW! Total for those 11 days comes out to 2.5 meters of the that wonderful elixir. With all that snow comes the bad. Avy levels have been high/extreme. Wind loading has also been a factor. But there's more snow on the way. Coverage has gone from so-so, to okay, to very good, and currently it's on the edge of outstanding. Today more snow for the PNW. Forecast indicating another 30cm plus for this current storm that will continue into Friday morning. Snow level will be down to Whistler base. Same goes for Washington and Oregon ski areas. Looking like another storm on tap for Saturday night or Sunday morning. Coverage will be excellent for the Christmas crowd. 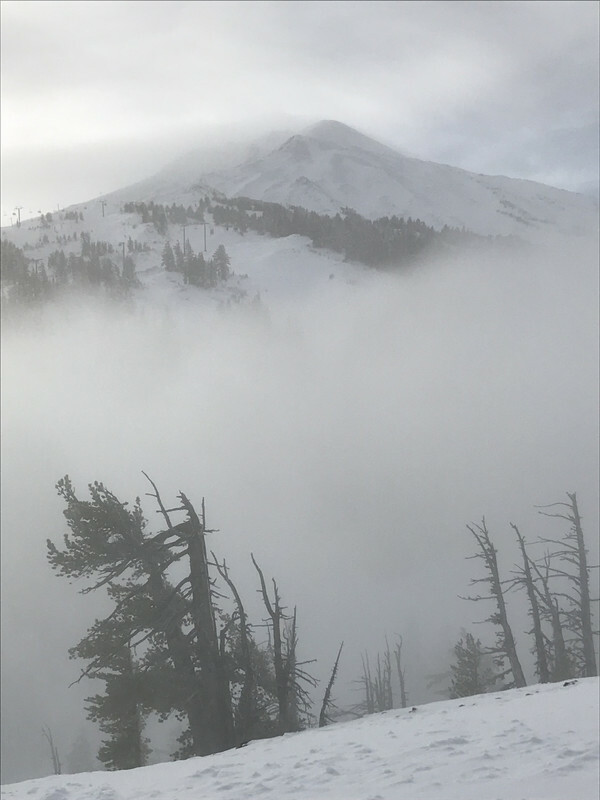 Fun fact: Mt Bachelor in Central Oregon opened up for operations on Dec 19th, 1958. The cost of a lift ticket then was $3. In today's dollars that would equate to about $26. Yesterday Mt. Bachelor offered up skiing on their slow double chair for $3. 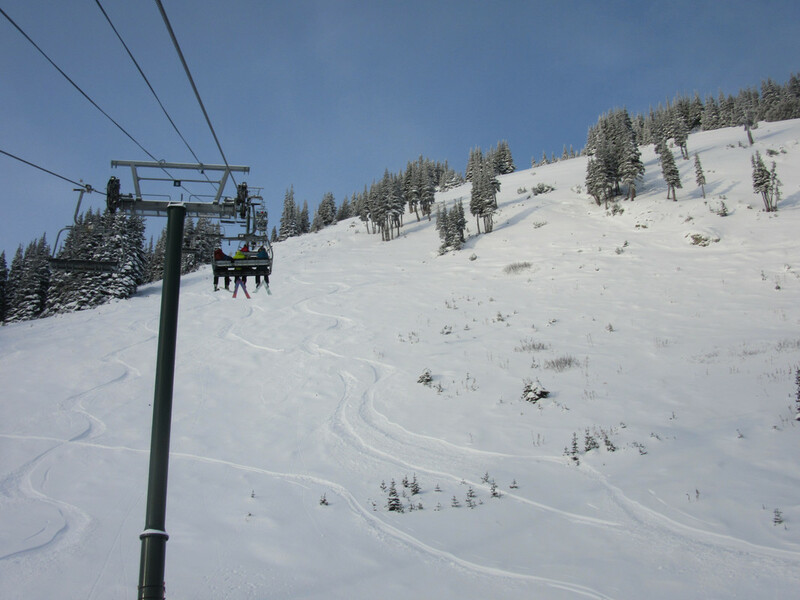 A lift ticket today at Bachelor will set you back a steep $86! My how times have changed. @Toadman, @Dabber, - keep the reports coming! Following this thread with keen interest as visiting Whistler for 10 days in early Feb (will contribute to the updates while there). @Dabber, had to Google the DPS Spoons - bit too serious for my ability off-piste. Can you recommend a ski shop for rental on the Blackcomb side of town (staying at the Fairmont Resort complex)? I have my own skis/boots but my brother needs to hire kit. Also do you have any recommendations for Instructors/Ski Schools in Whistler/Blackcomb? 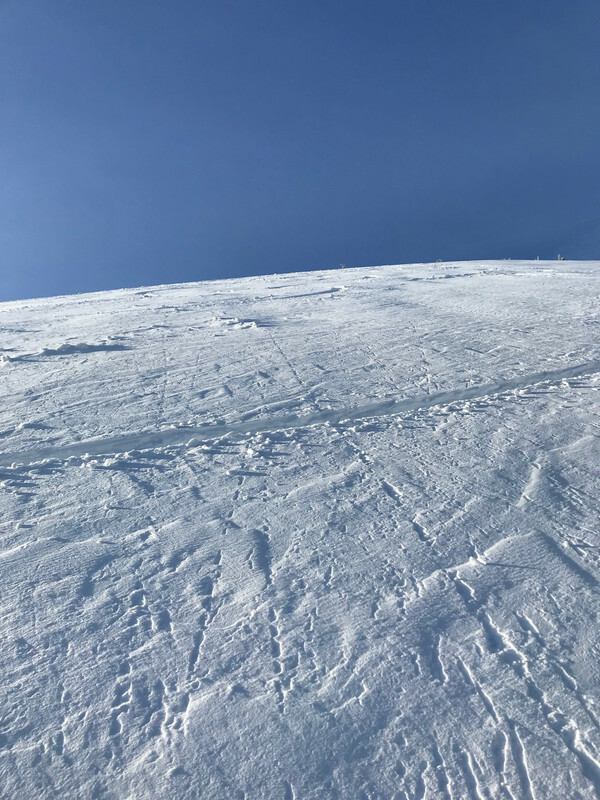 I'm a middling-advanced piste skier but have a complete mental block (freeze/lock up) when occasionally confronted with anything deeper than boot depth. My brother is firmly attached to the intermediate plateau. I'd like to buy him a couple of lessons (private if cost not ridiculous) & maybe one for myself to break that block. "I'd like to buy him a couple of lessons (private if cost not ridiculous) & maybe one for myself to break that block." All these reports are making me seriously excited for our January trip - keep it coming! A question: it's my husband's birthday while we are there, which restaurants should I look at for a celebratory meal? He likes meat and big portions... been looking at the Red Door as we're staying in Creekside, any thoughts? Also, I have a dream of doing the Dave Murray run, we're at the lower intermediate level (skiing European reds ok) - if we catch it on a groomed day, will it be doable? "Also, I have a dream of doing the Dave Murray run, we're at the lower intermediate level (skiing European reds ok) - if we catch it on a groomed day, will it be doable?"